I'm a big fan of mini scrapbook albums or mini albums highlighting things you love about your spouse. With a little creative spirit, this would make a really cute (and inexpensive) gift for any occasion, especially Valentine's Day...but you better hurry, V-day is fast approaching! 1 - The Junk Box - Chipboard Book: "100 Things I Love about You"
2 - Little Birdie Secrets - "How Do I Love Thee? Let Me Count the Ways" Her post shows pictures of the inside of her book. 3 - Taylored Expressions - You've GOT to check out the cute tin she put this accordian album in! 4 - Somewhat Simple - "Top 10 Reasons I Love You" She used only 5 chipboard circles and shows each piece of the album AND a tutorial. 5 - Everyday Moments - Love Flip Book. Her post includes more pictures. 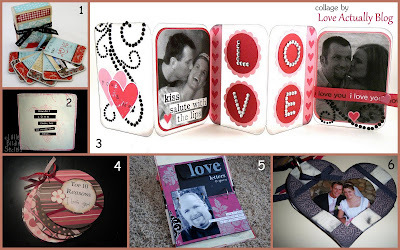 6 - Inspiring Creations - Mini Heart Album. Her post includes a tutoral and more pictures. OK, these, I LOVE! A few of my girlfriends and I are actually getting together this weekend to take pictures for our husbands. Perhaps, there will be a litle arts & crafts included to make some of these cute albums! I love this idea! I was trying to think of something inexpensive and thoughtful to do for my husband since we're going to be spending money on more 'responsible' things, like fixing my car. Boo. Now I get to make a trip to Michael's or Hobby Lobby! I'm a consultant for a company called Heritage Makers. It's basically a digital scrapbooking site. We have swatch books and deck of cards that would be really cute to make v-day gifts out of. So, even though the links of london wedding attire is given the prime links jewellery focus, it is important to look into links of london uk issues like the choice of hair and make-up, cheap links of london shoes that compliment the attire and links london jewellery other such seemingly trivial yet very cheap watch charm important details.Things to Look Out for friendship bracelets by choosing, shoes that compliment your sweetie bracelets uk wedding attire perfectly. Make sure to not only Links london Chains focus on the look of the shoe but to also pay links london pendants attention to the material of the shoe. The original ideas found on Love Actually are copyrighted and cannot be duplicated or altered for any other purpose beyond personal use. Please feel free to use my watermarked images, with a link back to Love Actually. Do not copy text from my blog without permission. If you obtained and shared any ideas from Love Actually, you must provide proper credit links on your blog. Love Actually by Cher is licensed under a Creative Commons Attribution-Noncommercial 3.0 United States License. Copyright - Love Actually Blog. Simple theme. Powered by Blogger.